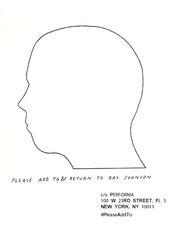 Performa, in collaboration with the Estate of Ray Johnson, presents “Please Add To and Return To,” a mail art activation celebrating the life and work of Ray Johnson. 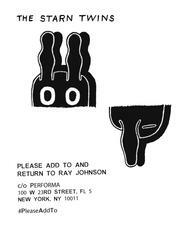 Johnson, the father of mail art, on the 20th anniversary of his death, Performa (in collaboration with the Ray Johnson Estate) placed a number of the artist’s “templates” back into circulation inviting participants to draw, collage or otherwise ‘add to’ them and then ‘return’ them to Johnson c/o Performa via USPS, the internet or through social media using the hashtag #PleaseAddTo. 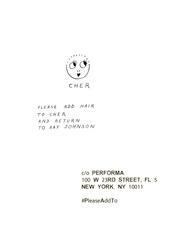 The plethora of creatively customized submissions from over eighty-five cities in nineteen countries are showcased in this exhibition which demonstrates that the legendary Johnson practice of creating art that is not to be bought or sold lives on. See a map of submissions at the bottom of this page. Performa is a multidisciplinary non-profit arts organization, founded by art historian RoseLee Goldberg in 2004, dedicated to exploring the critical role of live performance in the history of 20th-century art and to encouraging new directions in performance for the 21st century, engaging artists and audiences through experimentation, innovation, and collaboration. 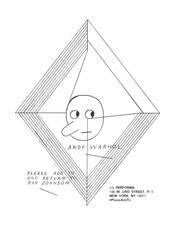 Part of Performa's mission is to present a biennial of visual art performance in New York City that illuminates the critical role of performance in the history of art as well as its enormous significance in the international world of contemporary art. The Performa 15 biennial dates are: Nov 1-22, 2015.